When you want to take a break from taking pictures and texting friends with your iPhone, consider using it to control the iHome iD50 App-enhanced Bluetooth Dual Alarm Stereo Clock Radio. I've been testing one, and I don't think I've ever had this much fun with a clock radio before. The truth is, I generally despise these devices. What I mean is, I like the idea of a clock radio. But the user interface is usually so awful that I give up trying to configure the unit after a few minutes. iHome solved this problem by creating the iHome Set app for iOS devices. Despite some user reviews on the App Store saying it doesn't work for their particular model (which I don't know since I haven't tested it with other versions), it works great with the iD50. 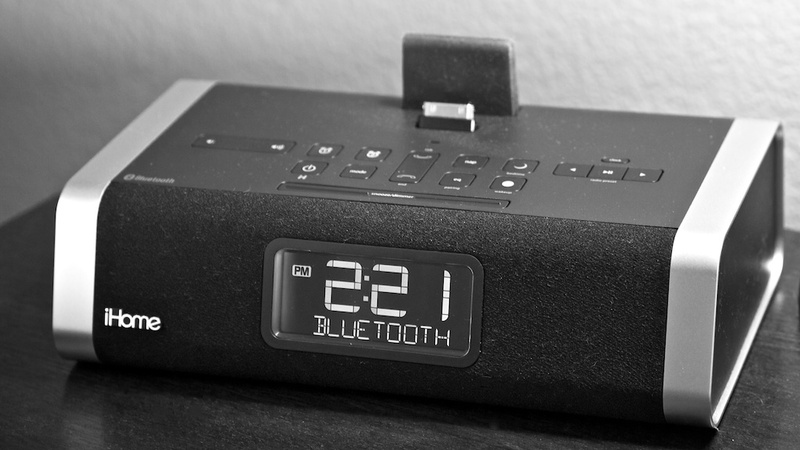 You can use the app by docking the iPhone to the clock radio via the connector atop the unit. But it's far more fun to use Bluetooth for communication. Make sure Bluetooth is enabled on the iPhone, then hold down the "EQ/Pairing" button on top of the iD50. Choose "add new Bluetooth device" on your iPhone, and they should pair without incident. From this point on, you're in remote control mode. If I want to listen to Internet radio, then all I have to do is launch Pandora, and choose "iHome iD50" from the share menu. I can stay in the same Bluetooth mode and play selections from my Music App. 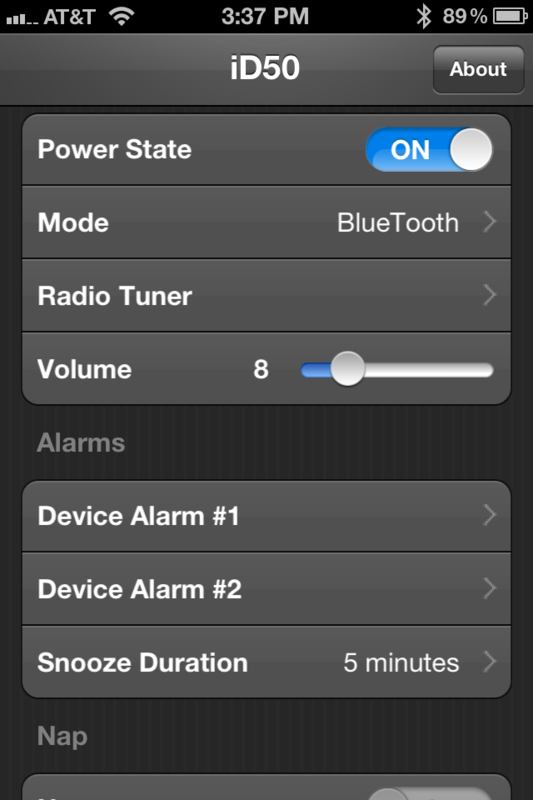 Radio functions are also easy to enable from the iOS Set App. 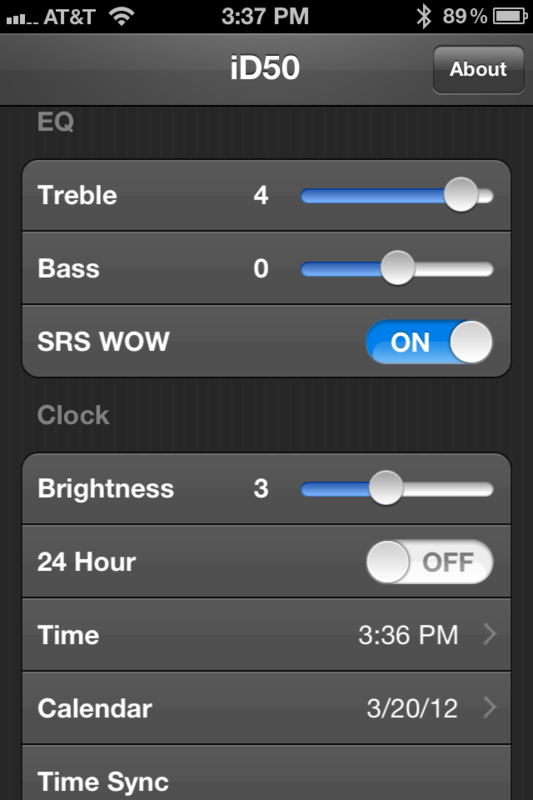 And the best part is that the station presets are much more fun to set via the iPhone than on the device itself. Clearly the functionality and geek factor is outstanding with the iD50, but how does it sound? Well, iHome included Reson8 speaker chambers, SRS WOW digital processing, and treble and bass controls into the iD50. These are features that you usually don't see on a clock radio. And if you play it like you would your old Sony single speaker unit, you'll miss out. I pushed the treble up to 3 out of 5, bass to 4 out of 5, volume up to 80 percent with SRS WOW on, and the iD50 sounded pretty darn good. This is definitely a "play it loud" clock radio. At lower volume levels it sounds like many other portable units. So kick everyone out of the bedroom and crank it up. As much as I like the Bluetooth connectivity, it can be finicky at times. I found the best solution is to turn off Bluetooth on the iPhone, then turn it back on. This seemed to solve the problem. On top of the iD50 itself are a number of physical buttons that can be used to set alarms, choose station presets, etc. I recommend that you don't use most of them. The basic buttons are fine (power, volume, pairing), but for much else, use your iOS device, or that old clock radio feeling may return. If you're connected via Bluetooth, the unit may beep a few times when you walk out of range. Others left behind in the area may wonder what's going on. You can prevent this by turning off Bluetooth on your iPhone before departing. Also, since this is a geek-friendly unit, it would have been nice if iHome had made this an RDS-capable receiver so the artist and song title would display on the LCD for stations that are transmitting that information. Seems like a missed opportunity there. $169 is a lot to pay for a clock radio. But the iD50 is more than that. Practically speaking, it's a charger for the iPhone and iPad, an alarm clock, AM/FM radio, stereo player for your iTunes music, speaker phone... and it looks pretty good too. But in use, the iD50 feels like more than the sum of its parts. It's one device that can change a room. And the iPhone app certainly elevates this unit to geek toy level. If it turns out to be a bit too much machine for the bedroom, possibly failing spousal approval, then take it to the office, or nearest man cave, close the door, and crank it up. For those times when you don't want to use your iOS device to control the iD50, it also comes with a "candy stick" remote control. Many of the functions are available via the remote, including radio preset switching, volume, EQ, and iPod control if you have it docked on the iD50. It's a good option to have.